This scene from a translation of De Materia Medica by Dioscorides is typical of the Baghdad School of illustration, which employed bold colors and symmetrical compositions to depict urban life. The use of an architectural structure to divide the painting into six sections is typical of the period, as is the fact that the oatmeal-coloured paper remains visible. 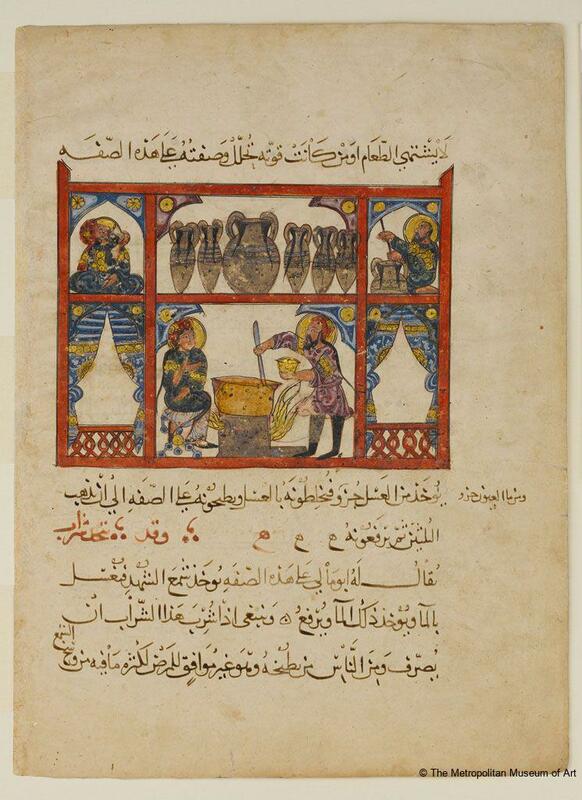 This folio, which comes from volume 5, chapter 9 of the work, depicts a pharmacist preparing a honey‑based medicine in a cauldron while an assistant upstairs distributes it into jars. Ackerman, Phyllis, Guide to the Exhibition of Persian Art. The Iranian Institute, New York, New York: The Iranian Institute, 1940: 189, no. case 72F. Anet, Claude, "Exhibition of Persian Miniatures at the Musee des Arts Decoratifs, Paris", Burlington Magazine, 22 (1912): 15–16, ill. pl. I, A (b/w). Buchthal, Hugo, Kurz, Otto and Ettinghausen, Richard, "Supplementary Notes to K. Holter's checklist of Islamic Ill. Mss. before 1350." Ars Islamica vol. 7 (1940): 151–52, no. 27. 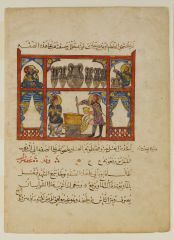 Buchthal, Hugo, "Early Islamic Miniatures from Baghdad", Journal of the Walters Art Gallery, V. (1942): 10, 15, 19–39, 20, no. 9, ill. fig. 12, 13, 17. Leaves from MS now in Top Kapu Saray, Istanbul, which has colophon giving name of copyist and date Rajab AH 621. No. 9, fig. 12 illustrates 56.20; no. 10, fig. 13 illustrates 57.51.21; no. 15, fig. 17 illustrates 13.152.6. Canby, Sheila R., Shah 'Abbas: The Remaking of Iran, London: British Museum Press, 2009. Canby, Sheila R., Beyazit, Deniz and Rugiadi, Martina, Court and Cosmos. The Great Age of the Seljuqs, New York: The Metropolitan Museum of Art, 2016: 178–79, no. 107a, ill. 178 (colour). Dimand, Maurice S., "A loan of Near Eastern Miniature Paintings", Metropolitan Museum of Art Bulletin, 22 (1927): 127. Dimand, Maurice S. (ed), "Dated Specimens of Mohammedan Art in the Metropolitan Museum of Art", MMA Studies 1 2 (1929): 208. Dimand, Maurice S., "New Accessions of Islamic Art", Metropolitan Museum of Art Bulletin, 16 (April 1958): 229, ill. 229 (b/w). Ekhtiar, Maryam, Canby, Shelia R., Haidar, Navina, and Soucek, Priscilla P. (eds), Masterpieces from the Department of Islamic Art in The Metropolitan Museum of Art, New York: The Metropolitan Museum of Art, 2011: 6, 87, 94, no. 55, ill. 94 (colour). Ekhtiar, Maryam and Moore, Claire (ed), Art of the Islamic World. A Resource for Educators, New York: The Metropolitan Museum of Art, 2012: 100–01, ill. pl. 18 (colour). Gluck, Heinrich and Diez, Ernst, Die Kunst des Islam. Propylaen Kunstgeschichte, Vol. 5, Berlin: Propylaen-Verlag, 1925: 95, 502, ill. (b/w). Kirketerp-Moller, Hertha, Det Islamiske Bogmaleri, Copenhagen: Nyt Nordisk Forlag, 1974: 5, ill. fig. 6. Kühnel, Ernst, Miniaturmalerei im Islamischen Orient, Berlin: Bruno Cassirer Verlag, 1922: ill. pl. 5. Martin, F. R., The Miniature Painting and Painters of Persia, India and Turkey from the 8th to the 18th century. Vol. 1, London: Bernard Quaritch, 1912: no. volume 2, 7, ill. pl. 5b. Ricci, Seymour, Catalogue d'une Collection de Miniatures Gothiques et Persanes appartenant à Léonce Rosenberg, Paris: Montassier et Odend'hal, 1913: 36–37, ill. pl. XVIII. Saliba, George and Komaroff, Linda, "Illustrated Books May be Hazardous to your Health", Ars Orientalis, 35 (2005): 30–31, ill. fig. 10 (b/w). Sarre, Friedrich and Martin, F. R., Die Ausstellung von Meisterwerken Muhammedanischer Kunst in Munchen 1910. Die Stoffe, die Waffen, Holz und Elfenbein, Munich: F. Bruckmann A.-G., 1912: no. 583, vol. 1, ill. pl. 5b. Stchoukine, Ivan, La Peinture Iranienne sous les derniers 'Abbasides et les Il-Khans, Bruges: Imprimerie Sainte Catharine, 1936 : no. II. Vever, Marteau, Miniatures Persanes. Volumes 1-2, Paris: Musée des Arts Décoratifs, 1913: ill. pl. 1 XXXVIII. Illustrated another leaf from this manuscript, dated here 1222, entitled "Le chien enrage", in Mutiaux collection (same leaf illustration in Anet reference), pl. XXXVIII (ill. another leaf, in Sambon collection (same leaf illustrated in Rosenberg collecti. Welch, Stuart Cary, The Islamic World. Vol. 11, New York: The Metropolitan Museum of Art, 1987: 34–35, ill. fig. 22 (colour). Kunsthaus Zürich (ed), Kunstschätze aus Iran von der prähistorischen bis zur islamischen Zeit. 27. Mai bis 5. August 1962, Zürich: Kunsthaus Zürich, 1962: no. 556, ill. pl. 82.